SOUTH PACIFIC ZONE - Real estate for sale in the Quepos and Manuel Antonio area of Costa Rica. A high demand tourist hot spot. Gorgeous home on a 1/4 acre property at Valle Pura Vida in the Quepos / Manuel Antonio area. The home is beautifully designed and features vaulted ceilings, a rainforest setting, and a mosaic pool overlooking a creek. Good deal for a luxury income producing home located close to Costa Rica’s most popular tourist attractions. 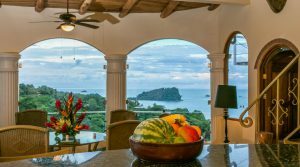 This home located in the “Pajaro Azul” neighborhood of Manuel Antonio features outdoor entertaining spaces with ocean views over of the Quepos Marina. 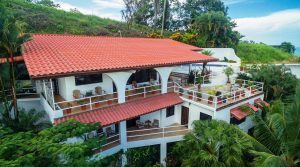 Perfect opportunity to own an income producing asset located near Costa Rica’s most visited tourist destination – minutes from the regional airport, the National Park, and the Marina! 2 bedroom / 2.5 bathroom main home with a separate 1 bedroom / 1 bath apartment in a private community in with zero HOA fees. 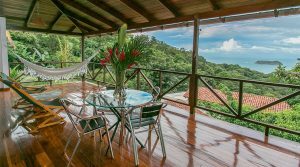 Situated on a 0.88-acre property located close to Manuel Antonio National Park, this home can function well as a private full-time residence or a part-time income producing vacation rental. Recently remodeled home on 1/2 acre with a private pool located in a small residential community of 8 homes. Each floor includes its own kitchen, living room, and 2 bedrooms providing multiple options for a buyer. 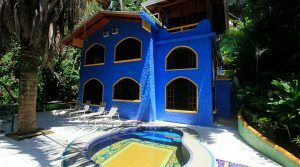 Can serve as a private residence or a multi-unit rental duplex conveniently located in downtown Manuel Antonio. 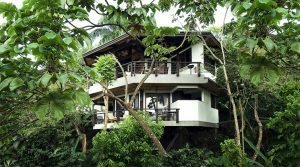 This beautiful home is one of Manuel Antonio’s premier income producing vacation rentals. Located on the exclusive Pacific Canyon Drive, the property is minutes from the area’s most popular tourist attractions. Incredible ocean views, a resort style pool, Balinese style furnishings, lots of wildlife, and it is selling furnished turnkey ready. 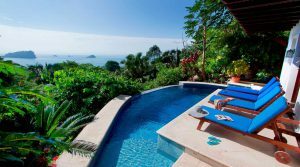 Resort style luxury home located in the most exclusive neighborhood in Manuel Antonio. Fantastic income producing vacation rental with three separate floors all with incredible ocean views, private balconies, and separate kitchens. Great deal listed well below replacement cost. Recent income / Expense reports available. 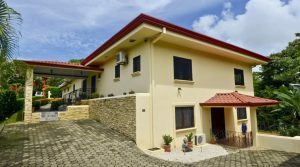 Three bedroom home on a 7.58 acre estate overlooking the coastline. The open design allows a cool breeze to flow though the house and out the rooms. This is a dream home getaway or possible vacation rental. Landscaped with tropical fruit trees and a system of internal trails, this property offers a balance between modern living and tranquil peace. 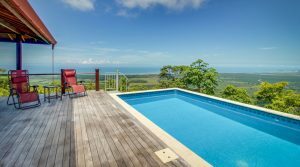 The magnificent four-bedroom home overlooks the city of Quepos and the Pacific Ocean. 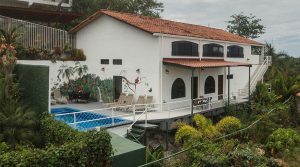 Close to Manuel Antonio National Park and the Quepos Marina, the house is centrally located and is a very strong income producing vacation rental. This property is spectacular the home is selling turnkey ready fully furnished! 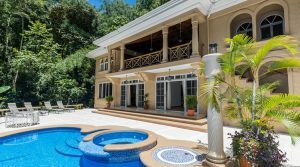 This is a great three-story home in the heart of Manuel Antonio. The has house easy access to Quepos, near the beach and National Park. The four-bedroom, four-bathroom house is being sold fully furnished. Covered balconies with hanging hammocks that overlook the Pacific Ocean. 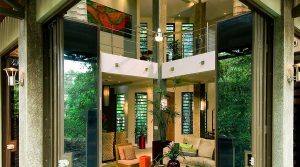 A great house with an easy transition into life in Costa Rica. Beautiful residence located inside of an all-inclusive resort community that offers the best of the best. A private beach, four resort pools, gourmet restaurant, concierge services, in-house property management and much more. If you are looking for a turnkey and hassle-free income-producing asset in Costa Rica, this is the place for you! Home on 0.27 acres with a view of the Pacific Ocean and local island. This tropical home is surrounded by lush rainforest creating a natural corridor for birds and monkeys to inhabit. The view, easy access and town amenities make this home a great vacation rental or private residence. Minutes from the beach and ideally located between Manuel Antonio & Dominical. 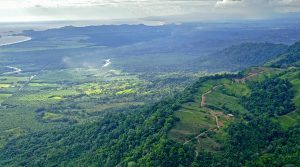 Excellent road system, private water supply, electric service, & property owners hold shares of a 140-acre nature reserve. Take a tour of one location and see ocean / mountain view estate parcels ranging in size from 2 to 37 acres. Prices start at $145k and up.